This is where R.C. Worst & Company Inc. talks about stuff related to our industry! There are a number of different pump switches you will encounter when searching for which submersible pump to buy. In this post we’ll explain pump switch operation, terms, and the pros and cons of the 3 most common types. What is a “Float Switch”? A float switch is a device that monitors the liquid level in a tank or sump. Inside the sealed float housing is a set of contacts that, when closed, will complete an electrical circuit. They are used to activate and deactivate pumps, alarms, timers, etc. When controlling a pump directly, a pump switch can be wired directly into the motor housing, spliced into the pump’s power cable, or the pump can plug into the switch via a piggyback plug. Since pump switches carry the full amperage of the pump, make sure the float you pick will be able to handle your specific pumps amperage. Normally Open (NO) and Normally Closed (NC) refer to the state of electrical circuit when the float is at rest (hanging in an empty tank). 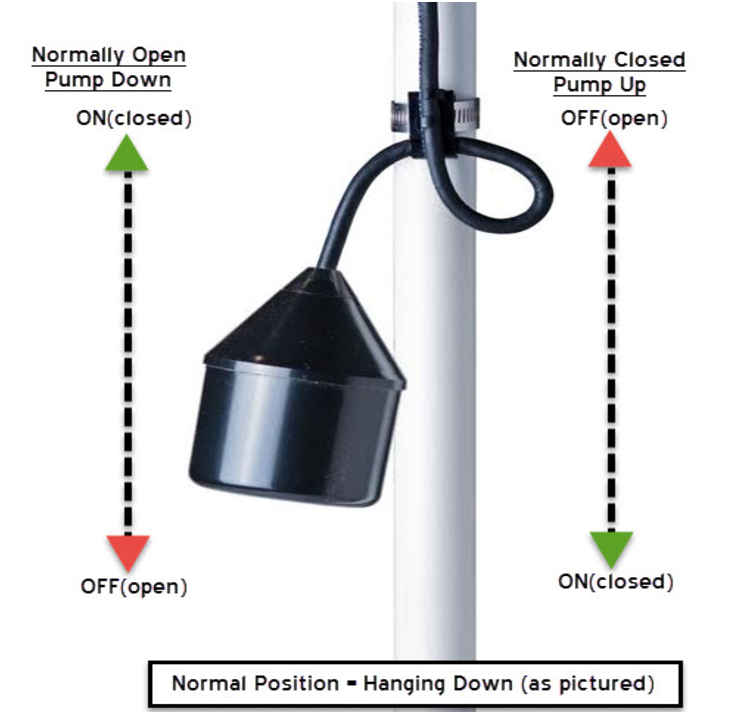 A normally open float does not allow electricity through it when the float is freely hanging. As water flows into the tank and raises the float, its contacts will close and power will flow through and to the pump. These are utilized for most dewatering, sump, and sewage pumps. A normally closed float is just the opposite; it’s contacts are closed when the float is freely hanging. As water flows into the tank and raises the float, its contacts will open and power will cease to flow to the pump. These are utilized for filling applications, such as filling a cistern with a well pump. To recap, normally open switches are typically used for pumps that empty (or pump down) a tank, while normally closed switches are typically used for pumps that fill (or pump up) a tank. The three main types of pump switches we offer are tethered, vertical, and diaphragm. All of these switches can be purchased with the pump (Automatic) or separately. Basin diameter will dictate which float options are available. Be sure to check the manufacturer's recommendations on minimum basin diameter before ordering any float. Requires a large basin (14 inches minimum) to function properly. Since the float travels up and down a fixed vertical rod, it can only be adjusted a matter of inches. For existing installations: If a pump operating via a piggyback plug fails, it can be easily swapped out. Replacement of a switch that is wired into the motor, however, requires complete disassembling and rewiring of the motor. It is usually best to replace your old pump switch with the one of the same type. For new installations: “Automatic” pumps include a pump switch either wired directly into the motor or with a piggyback plug. As a rule of thumb: If your basin diameter is 14" or greater, go with a tethered switch for longer pump life. If your basin diameter is less than 14", go with a vertical switch. Diaphragm switches are for those unique applications where neither a vertical or tethered switch can fit. Need help selecting a float switch? Give us a call at 855.329.4519.